An Exhibit by Active Minds, Inc. Send Silence Packing is an emotionally powerful exhibit that increases awareness and openness about suicide prevention. 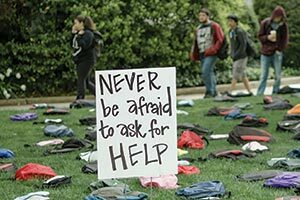 The visually striking display of more than 1,000 backpacks with personal stories honors and represents the number of college students whose lives are tragically lost to suicide each year. The exhibit travels nationwide to inspire action for mental health awareness, breaking through the silence that surrounds mental illness and suicide. *Send Silence Packing is a trademarked program of Active Minds, Inc.